The word through also has several shades of meanings. It can mean across in a strictly spatial sense (as for instance a transatlantic line), or by the intermediary of � as something done "through" a person's influence. When one speaks of diffuse sunlight being focused through a lens, both of these meanings are implied; the light rays pass across the specially shaped piece of glass, but the special form given to the glass condenses the rays making them more effective in producing certain results, such as the production of heat. A "transpersonal action" can refer to the release through a person of either a stream of transformative energy, perhaps able to produce seemingly miraculous results, or of information not normally available to the present-day mind. Nevertheless, the person through whom the power or the information is released cannot be merely anyone, any more than a lens can be any piece of glass. The personhood of the human being must have a special kind of form as well as unimpaired translucency. It must be sensitive to transpersonal impressions and attuned to the quality of being of the active source of what is conveyed, transmitted, or "transduced." Any transpersonal action or communication implies, first of all, the existence of beings, or sources of power and information, beyond the level of personhood and culture, which is always intellectually and emotionally limited and to some degree exclusivistic. Such an implication, however, presents problems to the average intellectual person of our science-worshipping civilization. Intellectuals may be willing to peep through cracks in the walls of their rationalistic castles and to accept the possibility of discovering exalting vistas suggesting the wondrous nature of the country beyond the walls; they may be willing to learn techniques to pierce windows through the walls, perhaps even to make doors so that they can step outside. But if they do step out, they tend to see a blinding light under which everything seems to be a vast, all-encompassing oneness of being. If forms appear, they are given much the same separated, personalized character which familiar entities within the castle have always been understood to have. This situation is bound to remain essentially unchanged and transpersonal activity will remain misunderstood in spite of everything psychologists and New Age devotees may say until certain concepts are understood. First, a clear picture of a hierarchy of levels and of modes of structural organization must be accepted and its full implications consciously grasped. Also the nature of and motivation for communication or transmission of power from the higher to the lower level must be interpreted on the basis of operative principles based on fundamental values, instead of being analyzed in quasi-intellectual and technical terms. Above all the distinction between mediumistic "communications" and transpersonal transmission (or, symbolically speaking, between a plain piece of glass and a carefully formed lens) must be made clear. If this distinction is not made, the ideal of transpersonal living may become negative and potentially dangerous. Indeed this is a possibility against which one must constantly guard. This requires that one must develop the capacity for discrimination, which in turn can be based only on fundamental principles, such as the principle of operative wholeness through hierarchical structures, that is, holarchy. When fully reliable, discrimination implies the activity of a mind both free from cultural fashions and aware of archetypal principles of organization and of an intuition able to resonate to the particular quality being exteriorized (consciously or not) by whatever has called for discriminatory evaluation. An inner feeling for value has to be associated with an objective perception of the place and function anything occupies within the evolving situation (the cycle of activity) to which it belongs. Its proper place is the central factor in assessing the emotional character, significance, and value of anything, anyone, or any act. Where one belongs colors and often determines the quality of the relationships constituting any particular situation. 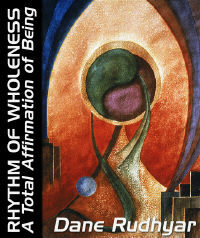 This is especially true in situations claiming or implicitly believed to be transpersonal and thus to be the result of a relationship between two different levels of activity and/or consciousness. What are these levels? What motivates the relationship? What is the mode of operation of the relationship and of the interaction between the related factors? Answers to these questions depend on he determination of the nature of the levels to which the related factors belong � thus on the ability to use discrimination. Such an ability requires not merely "feeling," but a mind capable of objectively perceiving the place, function, and motivation of the perhaps multiple elements of the situation as a whole. Wholeness demands that any situation be approached as a whole. Analysis of a particular situation or experience may seem to reveal only horizontal relationships at work between entities existing at the same level of being; but this may be so only in relation to the surface actions and reactions of the participants. Vertical relationships also may be implied, and they may even be the basic factors if one or more of the participants in the situation is deeply dissatisfied with, or only superficially belongs to, the level at which the situation apparently develops. Unfortunately, a truly holistic approach is often difficult to take and sustain, especially by human beings involved in the situation or when the situation includes persons used as transmitters by superior beings or who have become unconscious channels for the operation of catabolic forces. An example is the traditional case of an Avatar through whom a divine being � or in more modern terms, the values and ideals of a new step in human evolution � "manifests" or reveals transformative ideas. The vertical character of the relationship between the physical person and the power or entity active through him or her should be clear to a perceptive, open-minded, and sensitive witness; but history dramatically proves that this is not so in the great majority of the cases. Today "reductionist" philosophers and psychologists insist that strictly personal factors and horizontal conflicts can explain everything about the Avatar's life. The same type of explanation may seem even more relevant concerning the creative activities � and some noncreative and seemingly strictly personal actions and reactions � in the lives of great artists or in the behavior and inner motives of statesmen and inventors whose actions have profoundly affected the way of life and the thinking of large collectivities. From the holarchic point of view, this reductionist interpretation is superficial and essentially incomplete, even if welcomed by devotees of an egalitarian and nonhierarchical philosophy of life. Such an approach in music would reject the possibility of a polyphonic interplay of melodic lines, because music can only mean unison singing � as was the case in most ancient cultures. On the other hand, a great many people today � whether they consider themselves Spiritualists or refuse to accept such a label � are reductionists in reverse. They see their actions merely as a passive, guitar-like accompaniment to melodies that have little meaning and even less transformative impact � melodies believed to be played by a transcendent "spirit," a discarnate "soul," a "Master" whose name has come to public notice, or even "the Christ."